Great on-ear Bluetooth headphones under $100. Marshall Major II Bluetooth headphones deliver big sound from a compact package that is perfect for budget-conscious music lovers on the go. Note: The price can vary considerably depending on color. 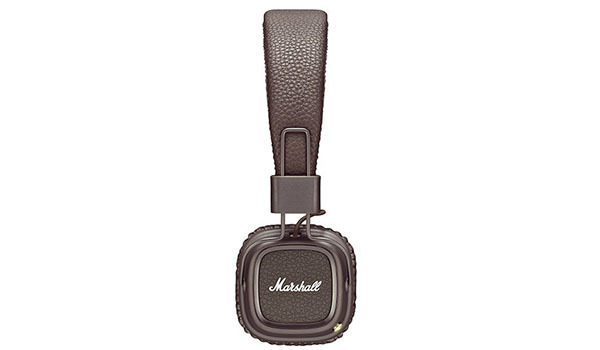 As of publishing this the Brown Marshall Major II Bluetooth headphones cost under $100 but other colors cost more. Best over-ear & on-ear headphones under $100. Soft ear pads rest easily on the ears. 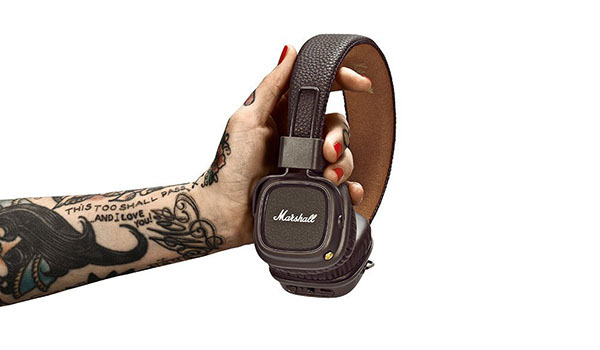 The ear cups on the Marshall Major II Bluetooth headphones look very compact and easy to wear. Noise isolation is average for a closed back on-ear set of headphones. There are two primary adjustment points. A wire slide adjusts the length of the headband and the same wire frame creates a hinge for the ear cup. A pivot joint is not available for these headphones, but they are small enough that you really don’t need one. The headband is covered with a padded material that isn’t too bulky or heavy. 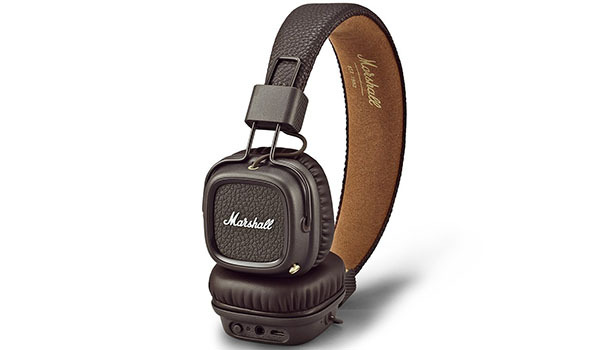 Marshall headphones do tend to run on the small side, so those with a larger than average head size may need to stretch out the headband a little bit. Good quality except for the plastic headband hinge. The overall construction and build quality of the Marshall Major II Bluetooth headphones are good, with a couple exceptions. Plastic ear cups are nearly indestructible and the headband design is solid. The weakest component of the design is the plastic hinge piece that allows the ear cups to fold into the headband for compact storage. This hinge can crack and break with too much sideways pressure or abuse. Probably won’t be a problem for you but it’s good to know the weak points. The collapsible design makes them a great option for listening to music on the go while being portable and wireless. The battery life delivers an impressive 30-hours of playback time on single charge. Bluetooth range is average at 30-50 feet (9-15 meters). You should watch out for fake units that have been sold on popular websites by individual resellers. These fake and counterfeit wireless headphones sound terrible and are poor quality, so they should be easy to identify if you end up with a pair. Be sure to contact the seller and/or manufacturer if you have any trouble with your headphones. Wireless portability with remote control and analog audio connections. These wireless headphones connect easily to just about any Bluetooth audio device. A microphone is built into the ear cup so you can take phone calls. A Bluetooth/power button is located under the left ear cup. A USB charging port and analog audio connection are also included here. With the built-in Bluetooth you’ll get the average 33ft (10m) of stable range. Volume and remote control is provided via a small gold analog-style button on the right ear cup. The control knob looks very cool and works equally well. This button can be pressed down or rocked in four directions to access various control features. The detachable analog coil cord that is provided with the wireless headphones also includes an in-line microphone and remote control. The coil might be annoying but you get used to it quickly. Big sound from a small package. 40mm dynamic drivers deliver some reasonably impressive volume levels from the Marshall Major II Bluetooth headphones. In Bluetooth aptX is supported which is nice, but no aptX HD. Possibly they’ll add in the next generation. There is no noticeable distortion, even at high volume. Bass is big and strong with a presence that can border on overwhelming for bass-heavy tracks. Highs and mids hold their own, but the overall sound signature is not considered balanced when factoring the strong bass response. If you like your music loud and proud, these cans will probably be a good fit. If you seek a more balanced or neutral sound you’ll want to consider some other pair of headphones. Marshall Major II Bluetooth headphones pump out big sound from a compact wireless package that is perfect for bass heads and listeners who like it loud.